Sen. Heidi Heitkamp (D-N.D.) raised more than $12 million in the first 17 days of October for her reelection bid to the United States Senate. 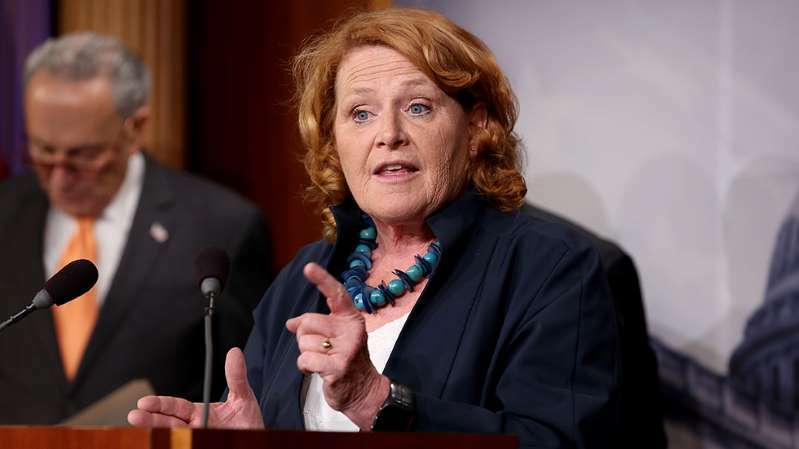 A filing from Heitkamp's campaign filed on Thursday showed that the Democratic senator raised about $12.4 million in contributions in the first half of the month, which HuffPost's Kevin Robillard noted on Twitter. The figure represents a significant surge in campaign funding, as net contributions for the entire election cycle show she's raised $26.7 million, per the new FEC filing. Heitkamp has been locked in a tough re-election battle in North Dakota against Rep. Kevin Cramer (R) and polls have shown Cramer with a solid lead. A new poll released by Gray Television this week showed that Cramer led the Democratic politician by 16 points, a lead that represented a six-point lead since September. James Henson, a partner in Strategic Research Associates, which conducted the poll for Gray Television, said Heitkamp's vote against Supreme Court Justice Brett Kavanaugh may explain Cramer's rising lead. "Sen. Heitkamp appears to have been hurt by her vote against Brett Kavanaugh's confirmation to the U.S. Supreme Court as well as by subsequent campaign missteps widely covered in the media," he said. Heitkamp announced on Oct. 4 that she would vote "no" on Kavanaugh, a decision that came as the Supreme Court Justice faced increasing scrutiny regarding sexual misconduct accusations against him. Kavanaugh has fiercely denied the accusations. "Our actions right now are a poignant signal to young girls and women across our country. I will continue to stand up for them," Heitkamp said in statement earlier this month. Heitkamp's brother, Joel Heitkamp, acknowledged that the decision may lead her to losing her re-election bid, but added that "she needs to like the person she sees."